September 26, 1963 was a hot and sunny day in Great Falls, Montana. 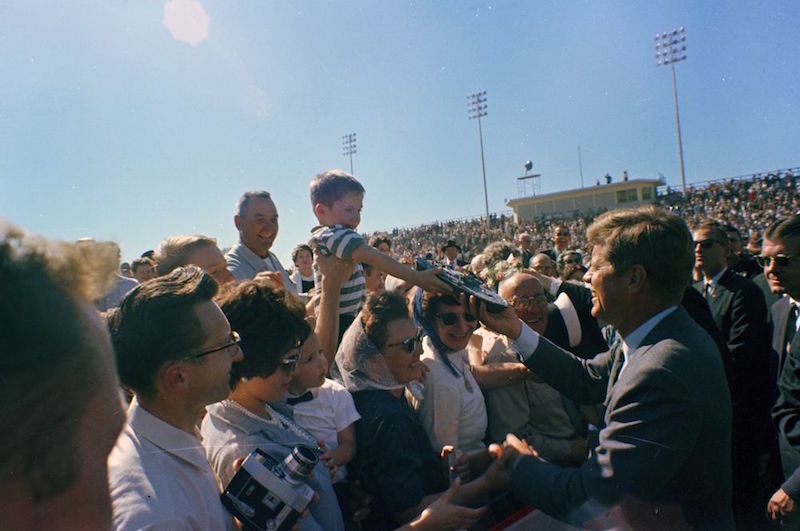 Yet neither the heat nor the state’s Republican leanings deterred crowds of roughly 100,000 from coming out to see President John F. Kennedy. As part of the “Conservation and Hydropower Tour,” the U.S. Bureau of Reclamation had arranged for Kennedy to visit Montana, along with several other red states. Having only narrowly lost Montana’s vote in the 1960 election (to Republican nominee Richard Nixon), his visit was welcomed by many. In fact, many in attendance were students. Some schools cancelled classes that day and others planned field trips to the event. Thirty bus loads of students were brought in from Conrad, Havre, Big Sandy, Shelby, Cascade, Monarch, Belt, Simms, Vaughn, Fort Shaw, and other surrounding communities. The entire Houskin student body was in attendance—all three of them. Many City and County employees were given time off for the event as well. Kennedy’s address lasted about twenty minutes and touched on subjects such as hydro-electric power, economic security for farmers, and expanding municipal sewage facilities. I am glad to return to Montana today to renew the pledges made here three years ago. Their final fulfillment requires the cooperation of many individuals, in many branches of public service and private life. And that cooperation has been forthcoming—these pledges are being fulfilled—and we can therefore look to the past with pride and to the future with confidence.